Oh Padstow you beautiful idyllic little place. You may have seen via my instagram that we are down in Cornwall at the moment! Phil introduced me to Padstow nearly 10 years ago on one of those many romantic getaways you do at the beginning of a relationship. We have returned nearly every year since and it still remains one of our favourite places to visit in the whole world. Australia, Hawaii, Thailand, you name it, on a sunny day the Cornish coast is up there with it's beauty. It's a bit of a pain to get to from where we live (280 miles to be exact) especially with Bella, but once here we feel a million miles away from the hustle and bustle of where we live. I honestly think the air feels fresher and I can't think of a better way to blow the cobwebs away. We've based ourselves in central Padstow for the week planning to spend time visiting all the beautiful places around it. ....and clear blue sky. With rain forecast later in the day we decided to make the most so quickly got dressed and walked 2 minutes down to the harbour, grabbed a coffee and set off on a walk. We headed up to the war memorial from the harbour and over the top down onto the beautiful sandy beach. 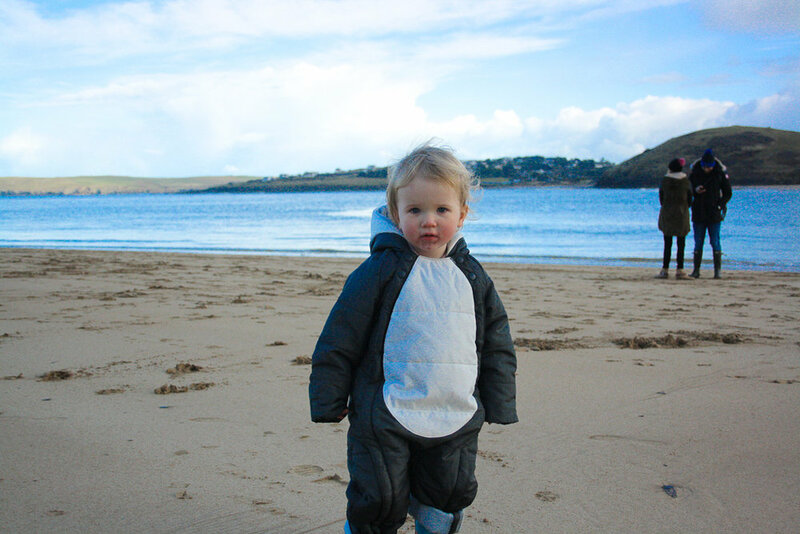 Bella was in her absolutely element running around the beach and in and out of the sea, this is where our snowsuit comes into it's own! She loves splashing in the water - Peppa pig has a lot to answer for with her love of muddy puddles. I adore the picture below, it perfectly captures how I was running around after Bella the whole time. I also like how the sun is shining down on us in the foreground with the sand looking really bright and our shadows visible, but you can see the very dark cloud from the hail shower (!!!!) that just passed behind us over Rock. We did see a gorgeous rainbow but sadly I didn't get a picture of it as I was so mesmerised. Bella's face is still pretty sore from the impetigo but a million times better than last week. We walked along taking it all in but once another rain shower had passed we called it a day and headed back to the harbour for a hot choc and cream tea. After cake we had a wander around beautiful Padstow with Bella on the reins, ours are from John Lewis and can also be attached to a highchair as a safety harness, find them here. I know some people are against reins but these have been a great little buy for us in this environment as Bella is so keen to walk all the time. As soon as she is in the buggy or carrier she is saying 'walk, walk, WAAAALK'. It means I can easily keep her out of the road and stop her from running off the side of the harbour! 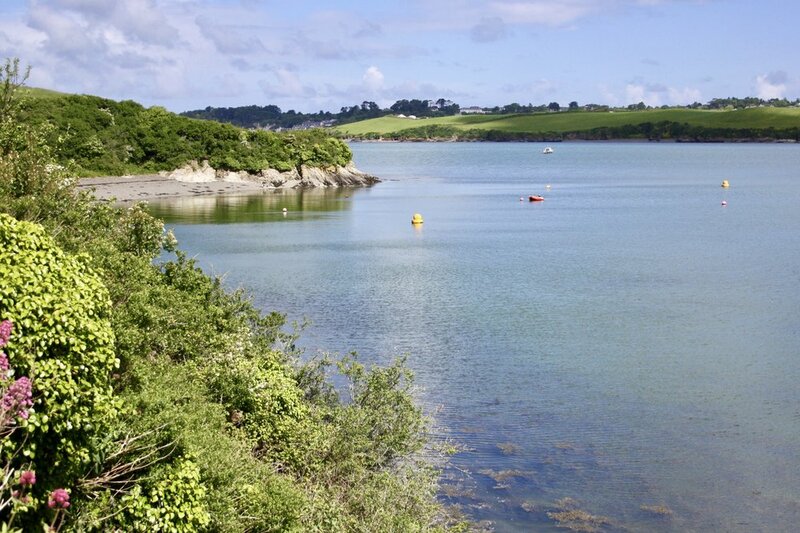 Later in the week we woke to another gorgeous day and decided to cycle the camel trail, which is an old Railway line that runs from Padstow along into Bodmin. There are loads of bike hire shops to choose from in Padstow. For Bella we decided on a seat on the back rather than a trailer as we thought she would love being able to see everything as we cycled along, helmet obviously a necessity. 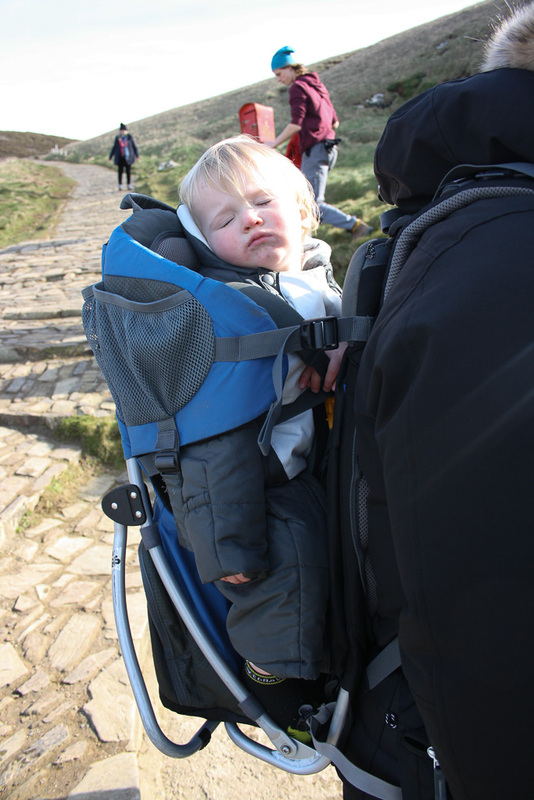 Rather hilariously my little nap dodger conked out on the back a few miles in, we couldn't believe it! 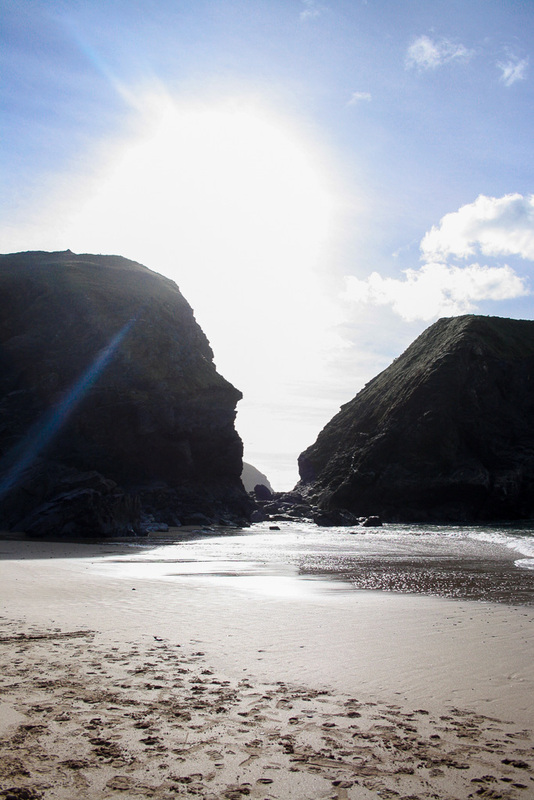 Another must see in the Padstow area are the Bedruthan steps. They are enormous granite rocks that jut out from a gorgeous sandy beach. Famous for smugglers and shipwrecks, there isn't a more spectacular sight than them sticking up out of the Atlantic with enormous waves crashing around them. 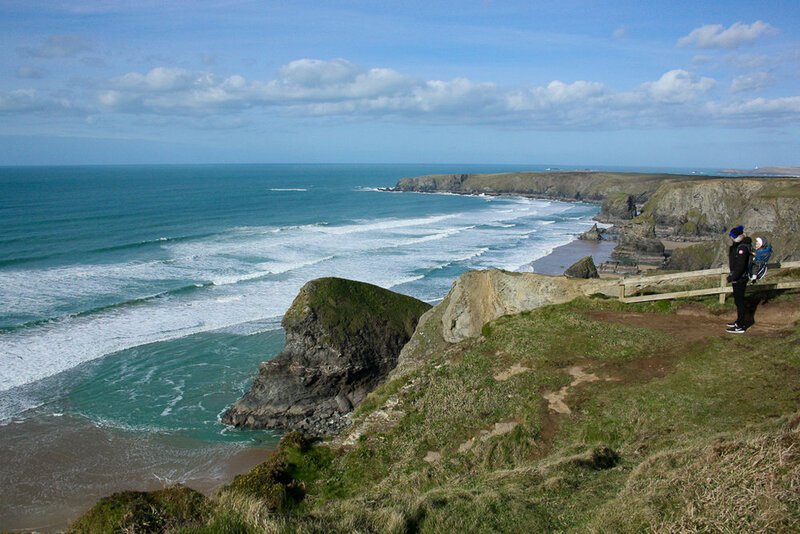 You park up on the cliff edge and can view the 'steps' and the stretching coastline from above, simply stunning. Depending on the tide you can climb down onto the beach (not for the faint heart FYI - ridiculously steep) and the view is equally as beautiful. Just keep an eye on tide times for the beach as it does come all the way in down there. When looking at the image below I can really see the profile of a face on the left hand rock? As you can see below Bella was absoloutely LOVING the views and taking it all in....NOT. It has to be the sea air but honestly the lengths I go to at home to get a nap in and she's nodding off on a cliff face on Phil's back!